Education systems around the world increasingly apply standardized high school exit exams to make achievement more comparable among graduates (see the IZA World of Labor article “Central exit exams improve student outcomes“). 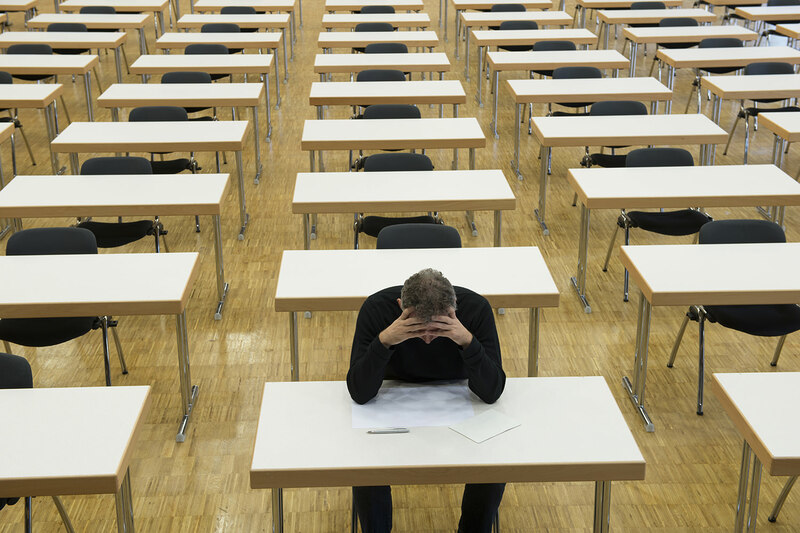 These exams can be an important feature of success or failure in people’s lives as getting above a certain threshold may determine entry into tertiary education and selective colleges. An example of such a high-stakes public examination is the need to obtain a grade C in English and math in the age 16 school-leaving exams in England (or Grade 4 in the new system). Achieving a grade C or better is considered achieving a “good pass” and has long been recognized as a key requirement for employment. In fact, this level of achievement is deemed so important that since 2015, it has become mandatory for students to repeat the exams if they fail to get a C grade in English or math and wish to continue in some form of publicly funded education thereafter. The idea behind the study is simple: For a “marginal” student on the brink of achieving a C level to end up just above or below the threshold is (in absence of manipulation) a matter of luck, and students just below and above the threshold should therefore be comparable apart from the fact that some have received a grade C and others have not. This is what economists call a “natural experiment,” which allows the researchers to isolate the effect of getting the C grade from actual performance differences in English. Using administrative data of students taking the GCSE exam in 2013, the researchers analyze the relation of getting a C to their probability of early drop-out from education (and employment) and their probability of accessing higher-level courses, which are known to have a positive wage return in the labor market, and the effect on the probability of entering higher education. 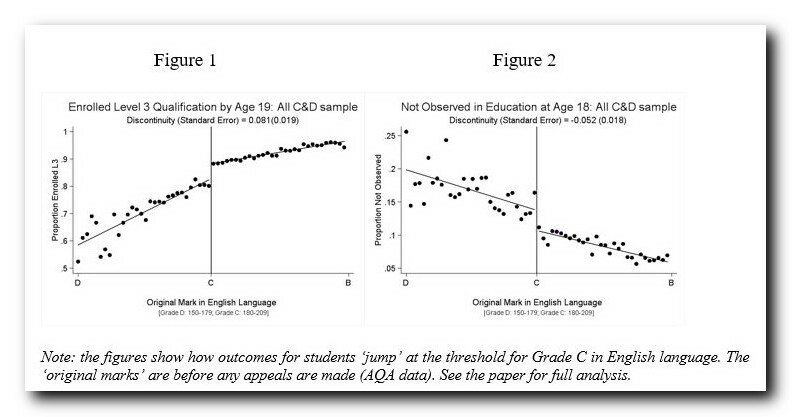 Just failing to achieve a grade C in English has a large associated cost. Narrowly missing the C grade in English language decreases the probability of enrolling in a higher-level qualification by at least 9 percentage points (illustrated in Figure 1). There is a similarly large effect on the probability of achieving a higher (‘full level 3’) academic or vocational qualification by age 19 – which is a prerequisite for university or getting a job with good wage prospects. There is also an effect on the probability of entering tertiary or higher education. Further, narrowly missing a grade C increases the probability of dropping out of education at age 18 by about 4 percentage points (in a context where the national average is 12%) – illustrated in Figure 2. Those entering employment (and without a grade C in English) are unlikely to be in jobs with good progression possibilities. In a well-functioning education system, there would be ladders for the marginal student – or at least alternative educational options with good prospects. However, the study suggests that the marginal student who is unlucky pays a high price. The authors stress that their findings do not imply that having pass/fail thresholds would be undesirable. Achievement of a minimum level of literacy and numeracy in the population is an important social and economic objective. But the fact that there are such big consequences from narrowly missing out on a C grade suggests that there is something going wrong within the system. Young people do not seem to be getting the support they need if they fail to make the grade (even narrowly). It also suggests that other educational options available to people who cannot immediately enter higher academic or vocational education are failing to help a significant proportion of young people make progress up the educational ladder. Thus, it is symptomatic of an important source of inequality in education, with associated negative long-term economic consequences for young people who just fail to pass such an important high-stakes national exam taken at the end of compulsory schooling. Want better grades? Get a good night's sleep!